This is not the first time I've sent praise in the direction of Erik Mohr. It may not even be the first time I've posted a blog entry devoted to this clever, diabolical cover designer from northern Ontario. But given recent internet activities surrounding my collection Monstrous Affections, certain things are becoming clear. 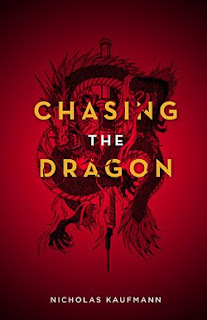 A large percentage of the people reading the book, and seeming to like it, would not be doing so without the baited hook of Erik's cover and design. The Publisher's Weekly review last year shouted out Erik's "jarring" cover illustration before they mentioned a word of my deathless prose; when January Magazine picked the collection for its best fiction 2009 post, the blurb began "The first thing that hits you is the cover." More recently, the blog calling itself The Casual Optimist just cut to the chase and used a link to a months-old National Post interview as an explicit excuse to post the image. Romance writer Vanessa Jaye reported on her blog Procrastination Station that she's enjoying the book, but leads into the discussion with a reposting of the cover and the comment, "Behold the power of cover art." And some bizarre corner of social media called tumblr has a feed/blog called This isn't happiness, which dropped all pretext of enjoying the collection, or indeed any words beyond the title, and just shared the image. 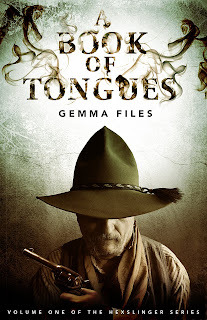 So I thought, in that spirit, I should take the space to showcase some of Erik's new work for upcoming titles out of ChiZine Press, starting with Gemma Files' first novel, A Book of Tongues. For those of you who haven't checked it out, might I recommend the Innsmouth Free Press - the website of the newspaper that's been covering the community of Innsmouth above and below sea level since the Old Ones walked the Earth. It is a magnificent journal, of which the denizens locals are justly proud. And if they make the odd mistake - hey, everybody's... well, humanoid. And I'm always there to help out a fellow journo. The downside of selling out the first print run of your story collection in late November, is that all through December, no one can find the damn thing on Amazon.com. * Hopefully, this didn't ruin Christmas for too many yard-apes - or worse, cause them to inadvertently pay $200+ from the online book dealers at Amazon. The upside of selling out the first print run of your story collection, on the other hand, is that there is a second printing. It's been available for awhile now at Amazon.ca, but as of yesterday, Amazon.com lay hold of some copies. So all is as it should be. Not in time for Christmas, true, but there are still plenty of shopping days 'til Valentine's Day. That's the kind of header you get when you have no one thing but many unrelated things to talk about in one day. So let us get to it, Yard-Apes. David Nickle, Monstrous Affections. A master of economical story-telling successful at raising the hairs on the back of your neck. A skewed and disturbing worldview. Thanks for sharing. Thank you for sharing, Daniel. It is Aurora season, yard-apes, which means that loving fans, readers, and self-loving authors get to nominate short stories, novels, and - ahem - collections and anthologies by Canadians or non-Canadians who live here for the fan-selected Canadian speculative fiction award. This isn't all about me, though. Other works I'd recommend you take a look at are (in long form English) Tesseracts Thirteen, edited by Nancy Kilpatrick and David Morrell (EDGE) (actually as an anthology, I think this goes into Best English Language Other), The Sunless Countries by Karl Schroeder (TOR), Objects of Worship by Claude Lalumiere (ChiZine), and (in short form English) "Off-Track Betting" by Madeline Ashby (FLURB), "A Patch of Bamboo" by Jill Snider Lum (Tesseracts Thirteen), and "The Island" by Peter Watts (The New Space Opera 2). Best Artist, I think, has got to go to Erik Mohr for The Tel Aviv Dossier, Monstrous Affections, Objects of Worship, The Choir Boats and The World More Full of Weeping, all from ChiZine Publications this past year. You can nominate on-line or by post here. Now on to the Other Fine Things category. The aforementioned Peter Watts this past year wrote but did not publish what he describes as his first piece of fanfic since 1976: "The Things," a blood-soaked hard-sf meditation on the premise of John Carpenter's classic sf/horror film The Thing. 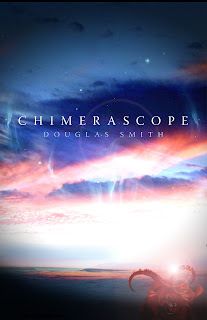 Here in the early days of 2010, he has now also published it, at the online sf 'zine Clarkesworld. You can read it here. And you can listen to a kickass podcast reading of the story, by Kate Baker at the same time as you're reading (right here - the player's at the bottom of the page) - which is what I did. The story's goddamn brilliant. Go listen to it/read it. Then put it on your lists for 2010 awards. ... in Bob and Dave and Doug's Flash-Flash Fiction Contest, and they're right here, at ChiZine Publications's website. Dedicated yard-apes may recall that the contest to find the best short-short-short story (300 words or less) closed to submissions last month, with promises that January 2 we'd come up with a winner and two runners-up. The winner would receive copies of we three judges' story collections: Horror Story and Other Horror Stories, by Robert Boyczuk; Objects of Worship by Claude Lalumière; and Monstrous Affections by David Nickle (me!). The runners' up would get their pick of which story collection they wanted. All that Bob and Claude and I had to do was read the stories, pick the best, and ChiZine would do the rest (including posting the winners on their website). All that is now done. So go check them out. The winner is Cedar by Donna Burgess; the two runners-up are One Zombie by Catherine MacLeod, and Layers Deep by Paul Abbamondi. Congratulations to the three top stories, and thanks to everyone who entered. The first thing that hits you is the cover. A seemingly innocuous portrait of a man with short cropped hair. But look closer and you see the real picture, something twisted, disturbing. The cover of Monstrous Affections was so compelling that I had to read it. And like the cover, the stories inside are not what they seem. But also, like the cover, the stories inside are brilliant. David Nickle has a talent for writing what, on the surface, appear to be normal stories peopled with characters you can identify with. Stories that on the surface have a feel of the everyday, but upon finer scrutiny outline things seen in a skewed miasma of real life gone horribly wrong. Ghosts, Vampires, mythical beasts and circus sideshows. You’d think that you were reading a book full of what you had always expected a horror story to be, but Nickle takes a left turn and blindsides you with tales that are not of the norm, but are all the more horrific because of surprise twists, darkness and raw emotion. 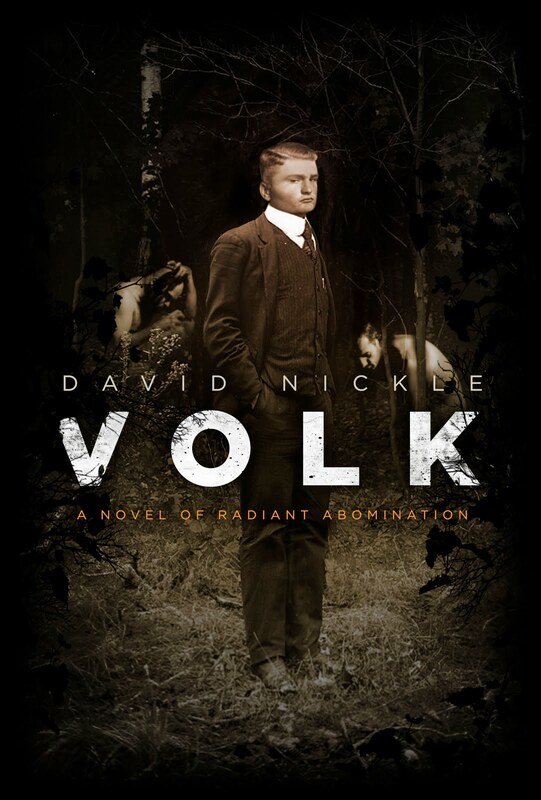 -- David Middleton"
Once again, I note that Erik Mohr's shrieking horror of a cover takes top billing in the review. That is as it should be. Boy's a genius. Always said so. Read January Magazine's whole year in review here.